Every pregnancy is special, and so is every mother-to-be. 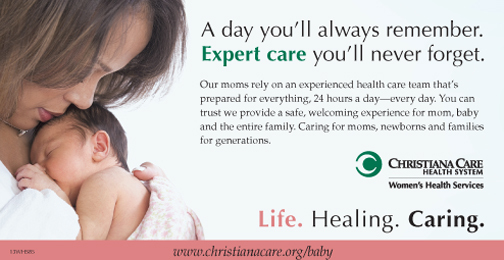 At Christiana Care Health System, we offer moms-to-be the option of a unique, hands-on group approach to prenatal care called CenteringPregnancy®. CenteringPregnancy® is different from a traditional prenatal program because it combines routine checkups with a lot of extras, including education, games and social time with other moms-to-be, who share experiences during this exciting time in their lives, in a comfortable setting. Research demonstrates that the CenteringPregnancy® model increases patient satisfaction, promotes healthy behaviors during pregnancy, decreases rates of preterm and low-birth-weight infants, and increases rates of breastfeeding and immunizations. Additional benefits include no waiting time for appointments, the opportunity for women to engage with and receive support from their peers, and more time for education and discussion than typical office visits might allow. Moms-to-be are free to ask as many questions as they wish. CenteringPregnancy® also provides an opportunity for moms-to-be to bond with other pregnant women who are due at about the same time they are. They meet on the same schedule as they would for routine obstetrics appointments, starting with once a month early in pregnancy and once a week as they near delivery. Typically, pregnant women learn about CenteringPregnancy® during their first prenatal visit so they can decide whether to participate or choose traditional care. There is no extra charge for CenteringPregnancy®, which is open to women receiving obstetrical care in the Women’s Health practice at Wilmington Hospital and Christiana Hospital. Our CenteringPregnancy® team includes heath care providers who are focused on caring for pregnant women. They are dedicated to helping expectant mothers to understand the dramatic changes in their bodies that occur during pregnancy. In addition to obstetricians, the team includes nurse practitioners and a certified nurse midwife. There are usually 10 moms-to-be in each group. The groups meet at Wilmington Hospital and at Christiana Hospital. Each session lasts from 90 minutes to two hours. The first session centers on nutrition. A dietician from Christiana Care’s Healthy Beginnings program educates the moms about proper nutrition. The dietitian also can meet with moms on an individual basis. Each mom-to-be receives a journal, which she will use to log her weight and vital signs during her exam before each group session. She also can use it like a pregnancy diary, recording special moments or need-to-know information. The moms-to-be range in age, and they include first-time moms and moms with lots of experience. Some have been through CenteringPregnancy® before and say they enjoyed the experience so much they can’t imagine any other kind of prenatal care. It’s an ideal setting to get answers to questions. How will I know when I am in labor? What about food cravings? Does breastfeeding hurt? Moms-to-be sign a confidentiality agreement, promising not to discuss what is said in the group with others. That sense of safety makes it easier for the women to open up and discuss whatever is on their minds. They also learn ways to remain comfortable throughout their pregnancies. They are informed where the operating room is located, in the event they require a C-section, as well as the recovery and postpartum areas. Shannon Pearson of Smyrna, now a mother of three, participated in the program twice. Many of the moms who go through the program form long-lasting friendships that continue after their babies are born. For more information about the CenteringPregnancy® program at Christiana Hospital call 302-733-6510. For Wilmington Hospital, call 302-320-4414.